The situation in Venezuela is getting worse and worse. The attack on an Assembly candidate on Election Day July 30th and the recent assault and robbery of arms from a military base shows that the opposition is no longer limited to street protests and parliamentary activity. We are on the verge of a civil war that is likely to be further aggravated. In fact, the Maduro government is trying to depose the Venezuelan parliament (National Assembly) and replace it with the new Constituent Assembly, which is nothing but a mechanism to perpetuate the Maduro regime. Yet, some key parties in the opposition coalition have already expressed their willingness to participate in regional elections. Among those supporting such participation are the former president of the National Assembly, Henry Ramos Allup, and the State of Miranda governor and former opposition presidential candidate, Henrique Capriles Radonsky. Participating in those elections means playing in the hands of Maduro. Worse, they are doing it at a time when the legitimately elected National Assembly is being dismantled. What exactly makes them think that Maduro will respect them? Furthermore, if the Maduro regime committed fraud in the July 30th election for the Constituent Assembly, what makes them think that fraud will not be committed against them? The only logical explanation is that the opposition knows that civil war is at the door. Those who are seeking to run in regional elections believe they can buy time and delay the catastrophe. Although they are wrong in their decision to participate, they would be correct in their diagnosis; a bloody civil war is likely to become a reality as unrest continues to unfold. Maduro is not going to give up power and will resist by mercilessly repressing the people. He fears no retribution, as he witnessed American passivity in the face of the Syrian Civil War. Maduro therefore counts on Russia rushing to his protection, which would only multiply Maduro’s firepower; we must avoid this situation and avoid repeating our critical mistake in Syria. Two weeks ago, President Trump imposed sanctions on 13 senior individuals associated with the Maduro establishment. Then, he threatened to increase sanctions and even consider targeting the oil sector if Maduro proceeded to install the Constituent Assembly. Elections for the Constituent Assembly took place anyway. A day after the election Trump sanctioned Maduro himself but so far no sanctions on the oil sector have been imposed. Why are these sanctions so important? Sanctions on the oil sector will put intense economic pressure on the regime and its ability to distribute rewards for loyalty, first and foremost to the guardians of the regime (the military and security apparatus). Although money from drug trafficking is a possible alternative income, it would be extremely risky for the Venezuelan government to rely purely on this illicit income. A ban on the oil sector would be impactful as the U.S currently buys half of Venezuela’s oil production. Such a ban would also carry financial penalties that would prohibit the Venezuelan state-owned oil company PDVSA from using dollars for its transactions. Furthermore, sanctions on the oil sector would effectively reduce the refinement of Venezuelan oil in the U.S and thereby reduce the power of CITGO (The American branch of PDVSA) to lobby Washington as it has effectively done so far. Seeking alternative buyers of oil would come at a high cost for Venezuela and it would be impossible to find an alternative banking system for its transactions, especially if the Europeans were to follow suit on U.S. sanctions. 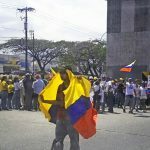 Drug trafficking might be able to provide supplementary income, but increasing its reliance on narco-trafficking would only perpetuate Venezuela’s isolation and be at risk of some hostile military action by the United States as the latter steps up its fight against drug cartels and transnational crime. American sanctions on the oil sector would not only inflict massive damage on Venezuela’s ability to reward and secure loyalty in the military apparatus. Therefore, the idea behind the sanctions would be to undermine the material and political promises that Maduro has made to his cronies, and therefore weaken their support for him. In addition, they would generate a domino effect of sanctions unleashed by other countries in Europe and Latin America. Some who oppose sanctions tend to compare it to the U.S.’s embargo against, Cuba, where the people suffered but the government survived; thus, they reject sanctions. However, there is a difference between the cases of Venezuela and Cuba. The different waves of sanctions on Cuba had not been joined by the countries of the world. Furthermore, the United States did not establish a blockade on Cuba’s trade with other countries and it largely failed to prevent foreign countries and companies from doing business with Cuba. Likewise, American pressure on foreign business was not always effective and the embargo was relieved by all kinds of measures taken by the United States itself. More importantly, the Soviet Union effectively relieved the effect of the sanctions for three decades. The Soviets committed to buying Cuba’s sugar, a deal which helped sustain the Cuban economy. Likewise, Cuba joined COMECON, an economic organization of socialist states where it benefitted as well. More importantly, Europe has become Cuba’s most important trade and investment source following the collapse of the Soviet Union. The European Union accounts for 20% of the Cuban trade (both imports and exports) and is Cuba’s largest foreign investor. In fact, one of the most difficult times for Cuba was when it found itself in political isolation and economic bankruptcy in the aftermath of the Soviet collapse before Europe and Venezuela came to Cuba’s rescue. Furthermore, at the time of the embargo on Cuba, human rights were not the issue for which sanctions were imposed, but for its expropriation of American assets. It only later evolved into a human rights issue and by the time Castro had a well-established and virtually irreversible totalitarian regime. Cuba also embarked on a campaign to display their supposed social equality and effective socialized health care system. By contrast, Venezuelan repression, scarcity and violence are evident to the world. Now, isolation and sanctions on Venezuela enjoy tacit international support. Most Latin American governments and the Secretary of the Organization of American States (OAS), Luis Almagro, have expressed serious concern about the Maduro government. Countries of the European Union announced they will not recognize Venezuela’s new Constituent Assembly. Therefore, the Trump Administration must take the lead in imposing crippling sanctions on Venezuela and calling on the rest of the countries to join the sanctions. If they do not, he should take measures against those who continue to do business with Venezuela. If this does not work, the U.S. must impose a naval blockade and make sure that no Russian, Chinese or Iranian aid flows into Venezuela, and that only humanitarian aid is allowed through. These sanctions must be accompanied by a call to the military to abandon the Maduro regime. This would not be a call for a coup d’état; since the regime is based on military support, defection of military officers should be enough to bring the regime down. The U.S should not worry about being accused of “imperial intervention.” This argument has been effectively used by the Maduro regime for years to put the U.S in a defensive position. 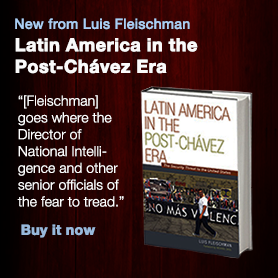 President Obama used this as an excuse to remain passive in the face of Venezuela’s violations of human rights and policy of alliances with aggressive state actors such as Iran and Russia; terrorist groups such as FARC, ETA, and Hezbollah; and other narco-trafficking groups. 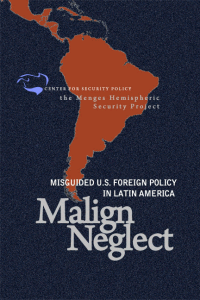 We should not forget that the Maduro regime is a security problem for the United States due to its geographic proximity. Therefore, we have no choice but to target Venezuela’s oil sector and effectively weaken support for the regime. As the Venezuelan people are on the brink of a civil war, time is running out; the U.S. must act now.